I also have links to other relevants reports that you may want to read. I hope you enjoy your virtual visit of the expo. Apart from being a place were a lot of technology is created, there are many linux users around here, and consequently we've had a lot of cool linux events. 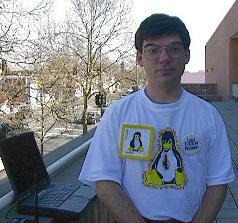 This time it was the LinuxWorld Expo. Before I go on, I should mention that you shouldn't confuse this with Linuxexpo, which is the RedHat event that's been happening for the last 4 years in North Carolina, especially because IDG registered linuxexpo.com in addition to linuxworldexpo.com (RH's linuxexpo site uses the linuxexpo.org domain). 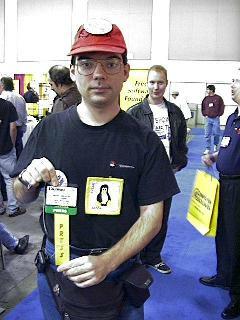 Michael Higashi, along with a few others officers and old time SVLUG members created LINC, which was to be the Linux Conference in the Silicon Valley in January 1999. They did a lot of work, including preparing speakers for conferences and tutorials. However, when IDG announced that they were going to have LinuxWorld Expo in March, the LINC members decided they would rather work together than compete with IDG. So, LINC got cancelled in favor of LinuxWorld Expo, and the LINC members handed out all their work to the LinuxWorld folks. When Jim Donovan from IDG first called me, I had not yet committed to attend LINC, I did a lot of talking with the IDG folk about coordinating with or buying out LINC reather than competing with it by haveing another show just over a month later. I gave them Larry Augustin's number, among some others amd they said they'd call. In several later conversations I twisted IDG's various arms pretty hard, and also spoke to Augustin about it.... and then it happened, Hooray! On the other hand, IDG not only had more money to throw at the problem, but they were also more experienced in this domain. It definitely made the show bigger and more successful (the show floor was more than five times bigger than what LINC had planned to get) . I think most of us will agree that it definitely was more than successful and that they did do a good job. I lasted 4 days, and the least I can say is that they were well filled. Between the tutorials, conferences, time on the showfloor, and the evening parties, there wasn't much time left to sleep. Because I took about 500 pictures, and kept about 350, I've made different pages so that you don't end up with one big 10meg page. Each page will have a few selected pictures, and you'll have a link to a library with all the ones related to the page. When that library is specifically worth having a look at, the page will let you know. I'd like to start by thanking the LINC volunteers as they were the ones who started all this, and who arranged many of the tutorials and talks. After seing a few comments on slashdot about linuxworld, like the story of Alan Cox not coming because at some point someone got the brilliant idea to tell the speakers that they'd have to pay for their own travel accomodations, a few people started to have somewhat negative feelings towards LinuxWorld and IDG. The LW folks did realize their mistake, but by the time they fixed it, it was too late, Alan had commited to something else. That's ok, we will see you at linuxexpo Alan. Despite all this, I cannot but thank the LinuxWorld team for all their work. The expo was a huge success, and it was the best one I had seen so far. Great job people! If you see yourself on some pictures that are featured in a page, drop me an Email. I'll try to add your name under the picture if you wish. If you'd like to use some pictures, you need to ask me first. So far, I've given everything away, but after spending 40+ hours on the 500 pictures, and on the web pages for this event, I decided that you need to work out some arrangement with me if you want to use anything on a commercial page (that's also without mentionning the $500 I spent on the (linux compatible) Ricoh 4200 digital camera that I bought in order to take the pictures at the event). (This page was, like other pages I've done, written rather late and with the help of caffeinated penguin mints, so please feel free to point out spelhing mistakes and factual errors if there are any, I'll update the page quickly.